Stick and Tissue Forum - Helicopter cook up. Stick and Tissue Forum › How to build model airplanes › Cook ups, Build alongs, participation builds, what have you. › Helicopter cook up. I was close on this one, who knows I may try it again someday. I love the Comet Sikorsky R6, but it does not lend itself to my modest engineering to figure out how to make it fly. A very interesting concept Strat-o, I don't know if I would want to tackle this one but it does look interesting, I have used pulley drives before and they do work well but you have to be able to get at the belts without to much difficulty. Plans for the 500 are complete I just have to get them on disk and we can start building, should have them posted here on Monday. I have come up with a possible solution to making a rubber powered helicopter easier to manage and enhances flexibility of design. 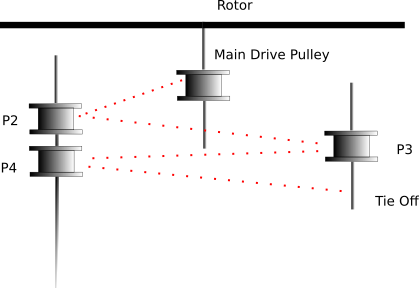 In the drawing the rubber motor follows the dashed line. It is routed from the main drive pulley to pulley 2, pulley 3, pulley 4, then tied off. The rubber wraps around the main drive pulley in a similar manner as old audio tape. The pulleys on the side evenly distribute the pull and stretch of the rubber. Advantages: Since there is minimal rubber to rubber contact, no lubrication should be required. Arbitrarily long rubber may be used so long as there is a sufficient number of pulleys for rubber routing. The drive pulley can be located anywhere as desired. For twin-rotor helis two drive pulleys can be used. Main drive pulley diameter can be changed to adjust for torque requirements. Disadvantages or issues to overcome: Replacing the rubber would be a pain. Also rubber wrapping around main drive pulley might get too large to manage but it's possible to use thin strong line like dental floss instead. Stretch winding might be feasible but difficult to manage. (If cord is used, stretch winding solves itself). Pulleys add weight. Hi Marlin, Paul, I have been out of the loop for awhile myself, Marlin to answer you question, multi-bladed rotors work just as well, they create more drag but I have made 4 bladed helicopters fly so yes this design can be made with 4 or five blades, have at it, Paul I am looking to get the plans finished by next week so as soon as I post them the build can start. Well I've been out of the loop for a spell. Is the cook starting soon.? Hi Ray, what about the feasibility of modifying this design to run a 4 or 5 multi-blade rotor? I assume the two bladed rotor is going to be more efficient but wonder what your experience has been with more blades in terms of comparative flight times. Hi Bob, I think it was flying models mag and I think it was CA glue, this helicopter will be easy, just have to get the plan pack scanned and saved on my disk so I can download it here. I hope I can do this this week, this cook up doesn't start until November so we still have time. Does anyone remember the cartoon in [I do not remember which magazine] the person has fishing line wrapping his hands and cannot get free to finish the airplane on the work bench? I keep picturing myself that way for my first helicopter. Or maybe it was hands stuck together with CA. Ok guy's I have everything unpacked now and I will be finishing up the plans and patterns this week, I should be able to post plan pack by next week. Alright we have a cook-up, I will have everything ready by mid September and will post plans here, this may be built to any size the builder would like to do. I will answer all questions. I'm in. Looks like a neat design with a simple rotor head. If we have a cook up on this we could do like a contest, we all fly, longest flight times wins, I will award a kit of the Hiller that I am working on.